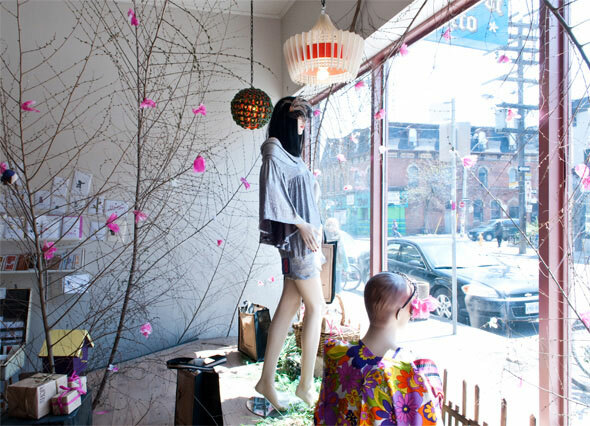 I've always liked the concept behind Parkdale store Shopgirls . 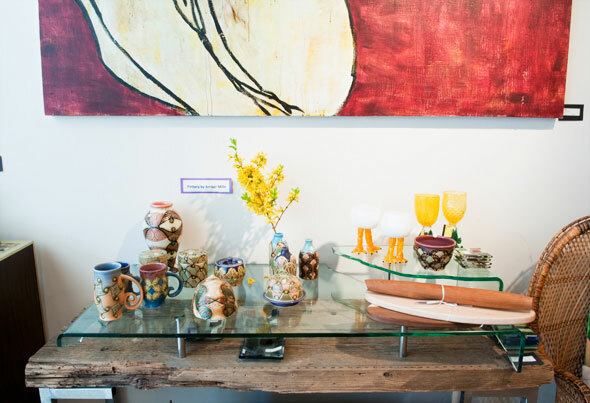 Owner Michelle Germain was working for Holt Renfrew and The Bay when she started expressing her secret indie side by hosting arts and crafts shows, selling clothing, jewelry, and accessories. And at each one, people came up to her and asked, "Where's your store located?" 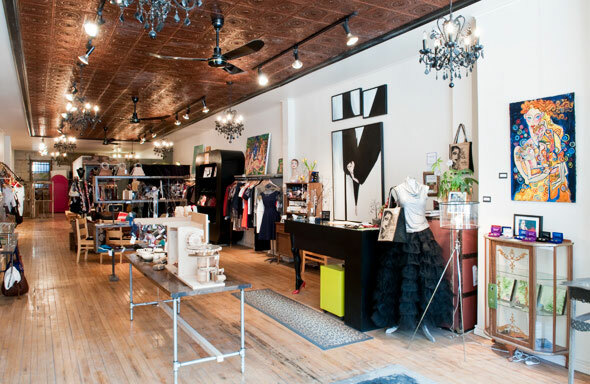 Eventually, she opened up Shopgirls, selling all Canadian designers, everything handmade, and art and housewares as well, according to store manager Ashley Winnington-Ball . 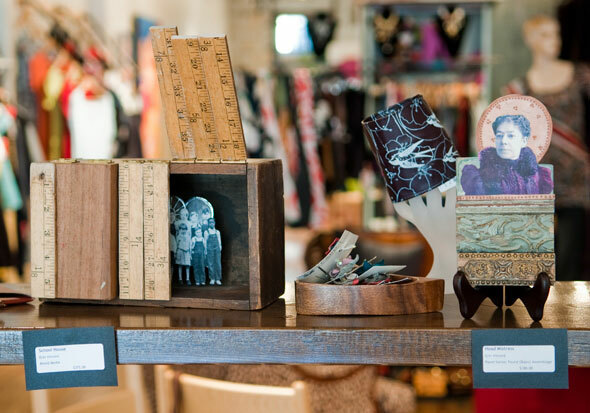 The store also has a unique structure with a variety of deals for artists, from a flat consignment fee to membership in the Artist's Circle, which offers more promotion and a higher cut for a monthly fee. Visual artists can even rent wall space. It was the results I wasn't wild about - while I often enjoyed the art and accessories in-store, I didn't like the clothing, which included plenty of AMAW-wear: duds that belonged on Artsy Middle-Aged Women types, with plenty of hippie-like deconstructed items, Susan Harris pieces, and "creative" clothes crafted from recycled pantyhose, teatowels, ties and the like. Yet on my more recent visit to the shop, I found that some of the new brands brought in - and the summer selection - made a clothes-shopping visit to Shopgirls a must. There were silver lame tops with dolman sleeves from Waterloo's Eve Farber ($189) and structured black frocks by Eve Gravel of Montreal ($150), although that sense of playfulness was still there, from the cute summer dresses crafted out of dead-stock vintage fabric by Toronto's My Mom Made That ($140-$160) and the bright-red shirt-dress from Maudlin & Joy ($160) out of BC. I'm still pleased with the accessories, too, including Julia Moon's poppy pins ($20-$40), Danielle Zippan 's laser-cute silver jewelry in cute shapes like hummingbirds and elephants ($25-$80), and LaKrause feathered headpieces ($35-$200). There were even a few pieces that wouldn't be out of place in a higher-end shop, like Maudlin & Joy's navy cinched-waist jumpsuit ($230) and the various draped jersey dresses by Kania that could almost hold their own with Denis Gagnon's twisty creations of late ($230). A lot of the AMAW sensibility remains in the form of teatowel skirts, Zyzanium tunics, and the usual screenprinted stuff, but there's a lot more to shop for at this Shopgirls.